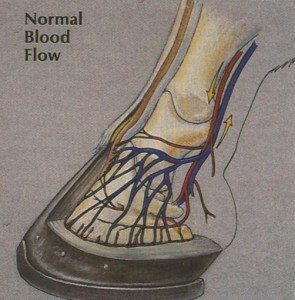 The inside of the hoof is arranged in layers called laminae which interdigitate and suspend the pedal bone in a stable position within the hoof wall. 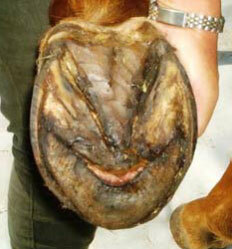 Laminitis occurs when the laminae become inflamed and the complex attachments within the hoof begin to fail. It is a very painful condition and in severe cases when the attachments fail completely the pedal (coffin) bone rotates and sinks within the hoof. The sole in front of the point of the frog might become soft and bulge outwards under pressure from the pedal bone and in worse cases may penetrate through the sole its self. You are unlikely to see all of these signs – consider laminitis if your horse shows any of these symptoms, but be aware that many are also symptoms of other hoof/lameness issues. Perhaps the most reliable and one of the earliest signs are paddling – but a horse with sinking may not paddle. 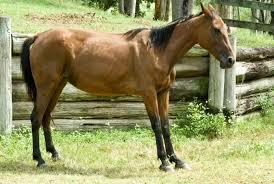 Symptoms will change as laminitis progresses from acute to chronic. 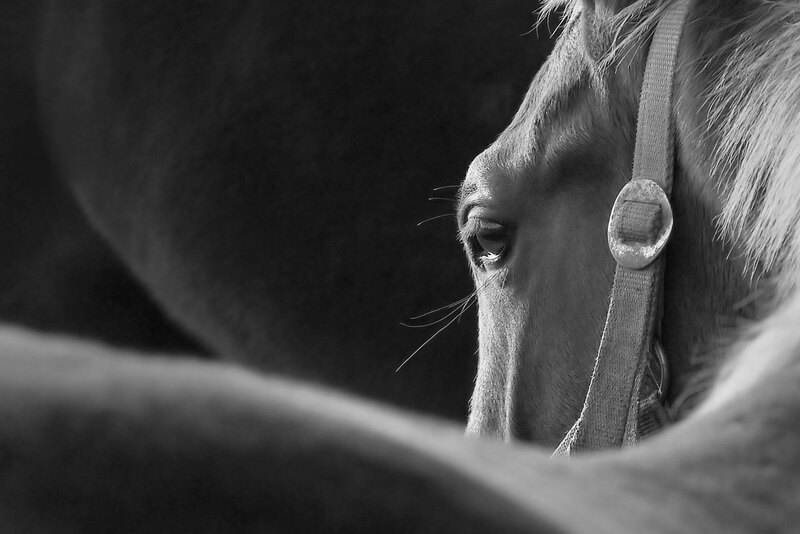 Every horse is different and will show different symptoms and different degrees of pain. Recognising and investigating any of these signs is vital as too many horses go undiagnosed because the early signs of laminitis are not picked up. The earlier you recognise the symptoms, remove the cause and support the feet, the better the outcome is likely to be. Laminitis is most often brought on by change, either in the nature, quantity or value of the feed or by changes in the environment, routine, management and activity so constancy is important when trying to prevent laminitis in horses and ponies susceptible to the disease. Daily inclusion of P45 helps to nullify the effects of change that result in the domino effect, as change cannot always be foreseen it is best to feed P45 on an everyday basis. By their very nature and the demands placed upon them, some horses suffer stress and as a direct result produce enormous amounts of adrenaline and corticosteroids which can eventually cause Laminitis. The connection between stress and intestinal malfunction is a damning one and its most marked impact is when an eventful stress occurs on top of some previous low level stress. Separately the horse may be able to cope as the horse is a resilient animal and can often endure chronic stress or indeed shrug off an isolated trauma but what it cannot take is a coming together of both. Day to day traumas can be anything from a sudden fear, infection, accident, concussion and sudden changes in temperature, management, hierarchy and feed etc, most horses unencumbered by any existing stress get over such things without too many lasting problems. It is different for those that unbeknown to ourselves harbour a hidden agenda of chronic stress these are vulnerable as they cannot bounce back so easily instead they go on to develop Laminitis etc. Laminitis can present with signs varying from a minor inbalance to a life-threatening condition and should never be treated lightly. Even mild cases can take many months to improve and some horses never regain full soundness. Significant numbers of cases of acute laminitis, associated with toxaemia cannot be saved, even with high quality intensive care. Prevention is much better than cure and most, although not all, cases can be prevented by good management, including regular skilled farriery. Laminitis is most often brought on by change, either in the nature, quantity or value of the feed or by changes in the environment, routine, management and activity so constancy is important when trying to prevent laminitis in horses and ponies susceptible to the disease. Daily inclusion of P45 helps to nullify the effects of change that result in the domino effect that ends in Founder, as change cannot always be foreseen it is best to feed P45 on an everyday basis or if that is not possible then at least at times when laminitis is most likely to occur. is an effective prophylactic for Laminitis consisting of 72% L94 and 28 %Magnesium Chloride. P45 is essentially an on-going detoxification formula with cellular re-charging properties and fits many mal-conditions to do with filled legs and oedemas often exacerbated by stress. Feed at 100ml per day as a positive depurative normally for 10 to 20 days and then if possible at a lower rate per day providing it is regularly fed. P45 is formulated to help in the recovery and prevention of chronic low grade laminitis. Laminitis is brought about by abrupt changes in the diet, by sudden unaccustomed concussive exercise and climate conditions. It can also follow shock and inappropriate hormonal surges as in Cushing’s disease and in drug treatment for the disease. The most common reasons caused by feeding is when the constitution of the diet changes – grazing is affected by rain after a dry spell or by frost, a roughage change, sudden increases in availability or when the balance of the individual parts of the diet alter. Such incidences cannot always be foreseen, however if they can it is suggested that the P45 be doubled in the three of four days preceding such events and continued for another three to four days after especially with those horses and ponies known to be prone to Laminitis. Tip – If despite precautions a horse or pony is suspected or actual gets Laminitis on the yard and P45 is in store start feeding it at 70ml twice per day (equivalent to feeding 100ml of L94) for at least for ten days and if a spoonful of Setback Salts are available too, so much the better. LAMINITIS (Low grade) – Feed L94 for ten days then follow on by feeding Rexflo on a regular everyday basis. When things are back to normal. LAMINITIS (Acute) – As soon as you can start feeding L94 and Setback Salts for at least 10 days, these can safely be fed with Bute prescribed by the Vet. Due to the unpredictability of Cushings disease Laminitis is an ever-present danger to Cushing’s horses. To this end feed L94 (Liquid) with Setback Salts every day as part of each bucket feed, raising the amount whenever there is a strong likelihood of an onset. L94 is a highly effective lymphatic, renal, cholagogue and liver tonic. It can be fed to all Equines including breeding stock, youngstock and competition horses on a routine or occasional basis. L94 is a blend of plant extracts known for their hepatoprotective and hepatogenic properties; their beneficial effect on the regulation of mitochondrial enzymes improves energy production for body functions. It has a gentle remedial action on the kidneys, spleen and pancreas and has a Cholagogue and choleretic action clearing bile stasis and improving fat digestion all of which is reflected in most importantly, circulation. There are very many reasons for feeding L94 one important one is that tiny leaks in the lining of small intestine play a role in diseases as diverse as COPD and Laminitis and is an outstanding reason for undulation in general health and performance. SETBACK SALTS specifically provide certain essential minerals in a form that is as close as possible to those found existing in the natural foods that the horse has evolved on. This helps the body to recognise such minerals as ‘food’ so they are then absorbed and assimilated more efficiently by horses that have suffered a setback and a weakened metabolism than nutrients from mined, inorganic sources. Setback salts can be fed to help act on the vascular system thus helping to normalise elevated pulse rate in the feet. REXFLO is a cellular regenerator, peripheral vasodilator improving the strength and tone of capillaries, elasticity of the walls of blood vessels and opening up surface areas enabling more blood to be circulated to assist tissue build up and tissue strength. 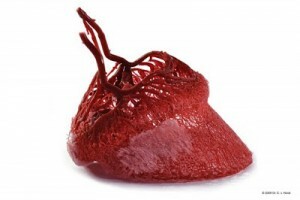 It helps elevate white cell production and liver glycogen reserves essential for red cell manufacture and for tissues dependant on sufficient liver glycogen presence.Swellings and Low grade lameness can often be due to less than optimum circulation to the feet. 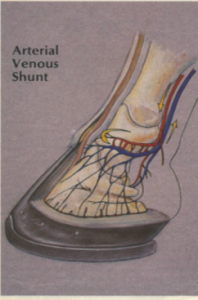 Nutrients and oxygen destined for the feet fail to fully reach certain areas causing tissue to become poor and necrotic developing an arterial shunt where the area is partially avoided and the blood finds another way back to the heart. These starved areas become weak with transient low levels of vasculitis and Lymphangitis occurring resulting in tenderness and pain when weight bearing on hard or stony ground, in turn concussion causes more inflammation and greater obstruction of nutrients and elimination of metabolites.